1.1. What is different in a zeolite membrane? The withstanding properties of inorganic membranes provide a set of tools for solving many of the problems that the society is facing, from environmental to energy problems and from water quality to more competitive industries. Such a wide variety of issues requires a fundamental approach, together with the precise description of applications provided by those researchers that have been close to the industrial applications. The contents of this book expand the lectures given in a Summer School of the European Membrane Society. They combine an easily accessible description of the technology, suitable for the graduate level, with the most advanced developments and the prospective of future applications. The large variety of membrane types makes almost compulsory to select a specialist for each of them, and this has been the approach selected in this book. In the case of porous membranes, the advances are related to the synthesis of microporous materials such as silica, carbon and zeolite membranes and hollow fibre membranes. 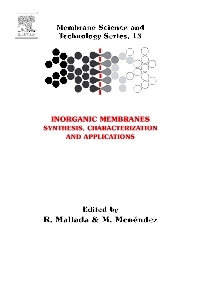 A chapter covers the increasingly relevant hybrid membranes. Attention is also devoted to dense inorganic membranes, experiencing constantly improved properties. The applications of all these membranes are considered throughout the book.